We’re coming up on the all-important holiday season, in which retailers will be giving away coupons and special promotional offers in hopes of boosting awareness and selling out their wares. But for those retailers, what’s the best way to actually reach consumers? Based on Accenture data charted for us by BI Intelligence, email is still the most effective method for consumers receiving and using coupons — by a wide margin. 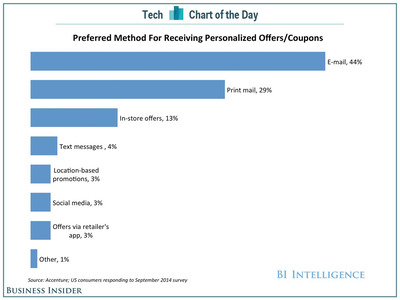 Around 44% of US shoppers said they prefer all their offers to come through email, and surprisingly, physical printed “snail” mail is the second-most preferred method. In-store offers can be somewhat effective, but if you want customers to take advantage of a special deal, relying on texts and social media might not be the way to go.